Our staff at Medifocus is committed to keeping our subscribers to the Medifocus Digest Alert on Ductal Carcinoma in Situ of the Breast abreast of the latest new research developments that have recently been published in the medical literature for this condition. In this issue of the Digest Alert, you will find a focused list of hand-picked journal article references that represent the latest advances in basic and clinical research for Ductal Carcinoma in Situ of the Breast. These articles represent the current state-of-the-art of the research that will hopefully lead to additional major advances and breakthroughs in the clinical management of Ductal Carcinoma in Situ of the Breast. You can access the summaries of each article referenced below by simply clicking on the article Title. We will continue to update you with the latest scientific and clinical developments through the Medifocus Digest Alert on Ductal Carcinoma in Situ of the Breast every 3 months. Thank you for your ongoing subscription to this publication. 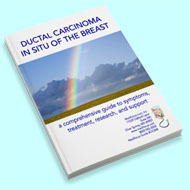 1: No Ink on Ductal Carcinoma In Situ: A Single Centre Experience. Institution: Breast Surgery Unit, Ospedale Policlinico San Martino, Genoa, Italy. marco.gipponi@hsanmartino.it. Journal: Anticancer Res. 2019 Jan;39(1):459-466. doi: 10.21873/anticanres.13134. 2: Breast conserving surgery with targeted intraoperative radiotherapy for the management of ductal carcinoma in situ. Institution: Department of Surgery, Helen Rey Breast Cancer Research Foundation, Los Angeles, California. California. Angeles, California. Monica, California. California. Journal: J Surg Oncol. 2019 Mar;119(4):409-420. doi: 10.1002/jso.25347. Epub 2018 Dec 27. 3: Risk stratification of ductal carcinoma in situ using whole-lesion histogram analysis of the apparent diffusion coefficient. Institution: Department of Radiology, Pusan National University Hospital, Pusan National University School of Medicine and Medical Research Institute, 1-10, Ami-Dong, Seo-gu, Busan, 602-739, Republic of Korea. youdosa@naver.com. ; Medical Research Institute, Pusan National University School of Medicine, Busan, Republic of Korea. youdosa@naver.com. ; Busan Cancer Center, Pusan National University Hospital, Busan, Republic of Korea. ; Siemens Healthineers, Seoul, Korea. ; Siemens Healthineers, MR Application Predevelopment, Erlangen, Germany. Journal: Eur Radiol. 2019 Feb;29(2):485-493. doi: 10.1007/s00330-018-5666-x. Epub 2018 Aug 2. 4: Phase 2 Open-Label Trial Investigating Percutaneous Laser Ablation for Treatment of Early-Stage Breast Cancer: MRI, Pathology, and Outcome Correlations. Institution: Sarah Cannon Research Institute at Rose Medical Center, Denver, CO, USA. scmibs@gmail.com. Journal: Ann Surg Oncol. 2018 Oct;25(10):2958-2964. doi: 10.1245/s10434-018-6623-2. Epub 2018 Jul 9. 5: American Society of Breast Surgeons' Practice Patterns After Publication of the SSO-ASTRO-ASCO DCIS Consensus Guideline on Margins for Breast-Conserving Surgery With Whole-Breast Irradiation. Institution: Department of Breast Surgical Oncology, The University of Texas MD Anderson Cancer Center, Houston, TX, USA. sgainer@mdanderson.org. Cancer Center, Houston, TX, USA. Houston, TX, USA. Center, Houston, TX, USA. Center, Houston, TX, USA. Houston, TX, USA. Cancer Center, Houston, TX, USA. Cancer Center, Houston, TX, USA. Journal: Ann Surg Oncol. 2018 Oct;25(10):2965-2974. doi: 10.1245/s10434-018-6580-9. Epub 2018 Jul 9. 6: Estrogen-receptor status and risk of contralateral breast cancer following DCIS. Institution: Department of Population Medicine, Harvard Medical School and Harvard Pilgrim Health Care Institute, Boston, MA, USA. Institute, Boston, MA, USA. Institute, Boston, MA, USA. USA. Institute, Boston, MA, USA. Cancer Institute, Boston, MA, USA. of Wisconsin School of Medicine, Madison, WI, USA. Journal: Breast Cancer Res Treat. 2018 Oct;171(3):777-781. doi: 10.1007/s10549-018-4860-5. Epub 2018 Jun 26. 7: Surgeon Variability and Factors Predicting for Reoperation Following Breast-Conserving Surgery. Institution: Department of Surgery, Brigham and Women's Hospital and Dana Farber Cancer Institute, Boston, MA, USA. Institute, Boston, MA, USA. Institute, Boston, MA, USA. Institute, Boston, MA, USA. Institute, Boston, MA, USA. mgolshan@bwh.harvard.edu. Journal: Ann Surg Oncol. 2018 Sep;25(9):2573-2578. doi: 10.1245/s10434-018-6526-2. Epub 2018 May 21. 8: Treatment Intensity Differences After Early-Stage Breast Cancer (ESBC) Diagnosis Depending on Participation in a Screening Program. Institution: The Breast Service, Royal Melbourne and Royal Women's Hospital, Parkville, VIC, Australia. Global Health, The University of Melbourne, Parkville, VIC, Australia. Australia. Australia. Global Health, The University of Melbourne, Parkville, VIC, Australia. Australia. Australia. Australia. Australia. Australia. Australia. Australia. Bruce.mann@mh.org.au. Bruce.mann@mh.org.au. Journal: Ann Surg Oncol. 2018 Sep;25(9):2563-2572. doi: 10.1245/s10434-018-6469-7. Epub 2018 May 1.